The review of the Millennium Development Goals is set for this September at the UN in New York. Heads of State will gather to discuss how to proceed over the next 5 years cognizant of the reality that a concentrated effort will be needed to reach some goals while others will be missed altogether. Although the lack of fulfilment of promises made at Gleneagles by countries to spend 0.7% GNI on aid is partially to blame, the bulk of blame lies at the devastating impacts of the financial crisis and food price shock. The financial crisis saw developing countries’ exports and, consequently, their GDP drop, placing a strain on funding for social programs and increasing public debt. Household income also dropped as the crisis precipitated layoffs in export-oriented and temporary work, with women being most severely affected. In addition, the global food price shock, which continue to affect many developing countries, has made it difficult for households to purchase food. Both of these crises have severely slowed down progress on meeting the MDGs. Countries will need to scale up efforts to meet the goals and increase funding if the goals are to be met. Currently a large proportion of global Overseas Development Aid is directed at middle income countries and post conflict states, Afghanistan and Iraq. The UN will call for funding to be redirected at poor and least developed countries. Calls will also be made to complete the Doha Round of the WTO and a global climate change agreement. The Doha round, also known as the development round, would see developed countries cut their farm subsidies, enabling the agricultural sector of developing countries to compete on an equal footing. Many developing countries are already feeling the effect of climate change and an agreement to mitigate and adapt to the changing climate is needed. Progress on the goals is mixed. For example, halving poverty by 2015 by 1990 levels will be met only by the sheer effort of the BRICS. Meanwhile, halving world hunger will be missed. Great strides have been made over the last 10 years at achieving universal primary education; currently 89% of developing world’s children are enrolled with Sub-Saharan Arica seeing an increase from 56% to 79%. Other goals such as reducing child mortality and improving maternal health will be missed altogether. Progress has been uneven among and within countries. Middle income countries have reached their goals while the least developed countries and Sub-Saharan Africa have struggled. Within countries there is a distinct urban/rural divide, with progress strongly correlated to wealth and education. 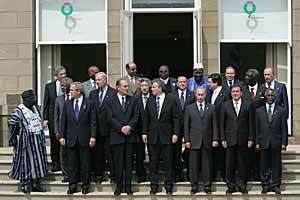 The eight goals agreed to by world leaders in 2000 were to eradicate extreme poverty and hunger; achieve universal primary education; promote gender equality and empower women; reduce child mortality; improve maternal health; combat HIV/AIDS, malaria, and other disease; ensure environmental sustainability; and develop a global partnership. Progress was measured using 21 targets and 60 indicators. The goals were to be reached by 2015.